United Way of East Central Iowa focuses on identifying the root cause of our community’s most critical challenges. To create positive, lasting community change, it’s not enough to find shelter for a family; we strive to change the condition that led to homelessness in the first place. How do we invest community resources? 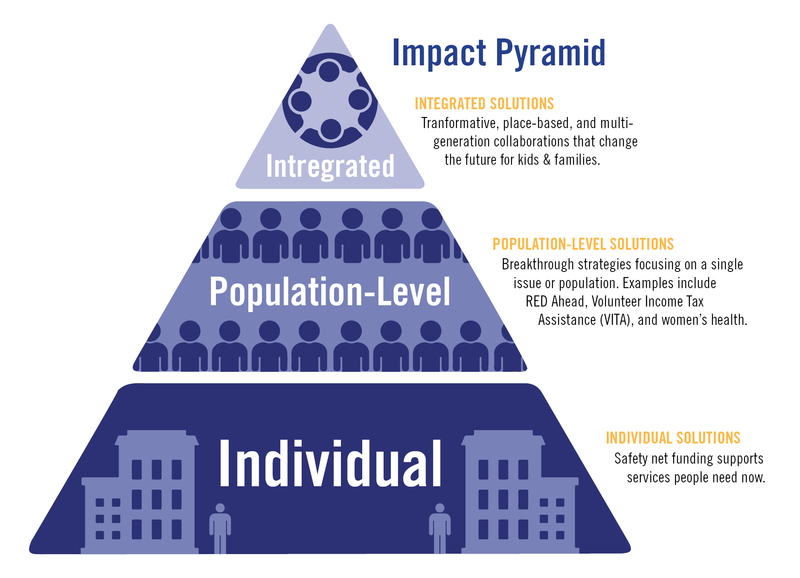 We invest in a safety net of services that meet people’s needs now. Three solutions teams help guide UWECI’s funding priorities. Teams include diverse volunteers who receive training in their focus area. By funding programs through local nonprofits, together we can build effective strategies to change these conditions. This requires the collaboration of diverse community partners: businesses, local nonprofits, schools, organized labor, government, neighborhood associations, faith-based organizations, and many others. View our current list of partners and programs. We invest in innovative solutions for entire populations. United Way of East Central Iowa has made all funding decisions for the upcoming 2018–20 cycle. Check back in fall 2019. Once an agency receives an invitation to apply for a type of grant, either Continuation or Enhancement and a focus area of Education, Financial Stability, or Health complete below. Three Solutions Teams help guide United Way of East Central Iowa’s funding priorities. Each Solutions Team is a group of volunteers based on their professional expertise, diverse background, and regional representation. The teams train in one of three focus areas: Education (Early Childhood and Youth), Financial Stability (Income), or Health (Independence) — with an overview of research and best practices, agency performance, ongoing community initiatives and collaborations. Along with United Way staff, the Solution Teams review results twice annually. Each focus area has a business plan and a report card to assess our annual progress on key strategies and our overall community goals. The Solutions Teams’ goal is to fund the most effective strategies to achieve the three community goals. They conduct an intensive and competitive review process every three years. You can also access the Power Point Training to review the presentation and view examples. Examples of the Process Map and Funding Justification Form are also available for you to review. It is helpful to contact United Way to discuss your ideas before writing your grant. Reach out to the Community Building Manager for your focus area to set up time to learn more: Leslie Wright at leslie.wright@uweci.org. © 2015-2019 United Way of East Central Iowa, 317 7th Ave SE, Cedar Rapids, IA 52401. All rights reserved.